David Warcup – a liar and a crook. There was no “damning Interim Met Report”. 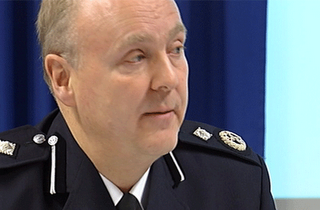 The “document”, as described – peddled – and used – by Jersey’s public authorities to undermine the child abuse investigations – and suspend the good Police Chief Graham Power – did not exist. The supposed “damning criticisms” – did not exist. Chief Executive Bill Ogley, Attorney General William Bailhache, Chief Minster Frank Walker, Home Affairs Minister Andrew Lewis – and Deputy Police Chief David Warcup – all lied. That all of Jersey’s relevant public authorities should have engaged in such a criminal conspiracy to pervert justice – and deprive the vulnerable, weak and abused of proper and fearless protection, is such a startling collapse in the very rule of law, as to be without precedent in the modern, peacetime democratic world. Another remarkable fact – and it is a tragic fact in so many ways – is that the necessary work to expose the rampant corruption of all aspects of public authority in Jersey, has had to be done by amateurs, by concerned good citizens. Not one mainstream media in Jersey, not one traditional journalist – I repeat, not one single traditional journalist in Jersey – has even touched the task of examining the evidenced corruption of the very rule of law in the island. Even though many of them have been – at various times during the last four years – handed evidence on a platter by me and other whistle-blowers. There is no excuse – there is no hiding place. And it is even worse than that. The press-conference given by Warcup and Gradwell – and all of the attendant spin – that corrupt exercise, now exposed to have nothing but a pack of lies at its centre – was not merely passively reported by Jersey’s failed mainstream media. The island’s media were active participants – along with the Chief Minister’s “Communications Unit” – in the development and build-up to those events. Although most residents of this island will not know, or understand this fact yet – the community of Jersey has been fortunate, in that there were “a few good men” – who have stood firm, done the right thing, and have striven to defend justice and the rule of law. Men like Graham Power, Lenny Harper and Rico Sorda. I’m very proud to stand amongst such company. I publish below the e-mail I sent on behalf of my constituents to the corrupt cop – the child-abuse concealing criminal – David Warcup, in September 2009. E-Mail by Stuart Syvret to David Warcup – 9th September 2009. This entry was posted in Uncategorized on 24/01/2012 .